Description: Those who follow European jazz would know that Rene Urtreger is a huge figure in France and Europe in general. Beginning his professional career in the 1950s, he toured Europe with Lester Young in 1956 and recorded the soundtrack for Ascenseur pour L'echafaud with Miles Davis in 1957. 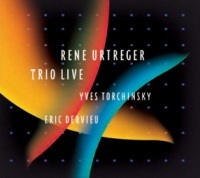 Urtreger is also known as the "U" of the famous "HUM", the legendary French piano trio with Daniel Humer and Pierre Michelot who have played together for over 40 years. In this recent live recording, he sounds as vital as ever. Inspired by the younger and capable rhythm section, Urtreger plays with vigor, speed and imagination. Clearly, getting "mellow" with age doesn't apply to him! A hard-core bebop musician who was immensely influenced by Bud Powell and Charlie Parker, Urtreger's playing is sensitive yet full and dense. This is an exciting, swinging live performance by a master pianist and his trio! True to the Atelier Sawano tradition, the sound quality is also quite good. Recorded live "Au Carre du Perche" in Mortagne, France by Christian Levacher in September 2005.